Asthma in children can present at any age. Asthma is a significant health problem worldwide, and it is one of the most common chronic diseases of childhood. Approximately 80 percent of children with asthma develop symptoms before five years of age, but the disease is frequently misdiagnosed or not suspected, particularly in infants and toddlers. Evaluating the presence of asthma symptoms is an important first step in establishing a proper diagnosis. Coughing and wheezing are the most common symptoms of childhood asthma. Breathlessness, chest tightness or pressure, and chest pain also are reported. Poor school performance and fatigue may indicate sleep deprivation from nocturnal symptoms. Wheezing or cough may occur at any time, but certain patterns and precipitating factors are typical such as during winters, viral illnesses, exposure to allergens or exercise. A careful review of prior and present medications (including over-the-counter and alternative remedies) provides information on adherence to therapy, drug efficacy, drug delivery systems in use, the accuracy of diagnosis, and control of asthma. 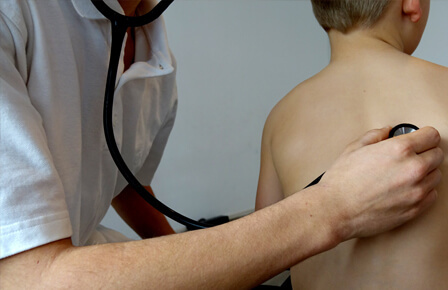 It is vital that your child has an up to date asthma action plan both at home and school and that you visit your Paediatrician regularly for an assessment.